When I work with someone, I always ask how the photos will be used - website, newsletter, prints, etc. When I hear "... maybe prints", I process the RAW files with no limitations in LR, and I get what I call "full resolution JPEGs" (I may be mistaken to call them that, but it's how I think of it). These of course you know can be big files, as much as 15-16 Mb. But I do have situations where it would be efficient and prudent, especially if the client wants the results in Dropbox, to cap the resolution at 5-6 Mb. So is there some rule-of-thumb or other measure where someone can see the differences between a 5-Mb resolution photo and a 15-Mb resolution photo when printed out? What size would it have to be before a difference is noticed? I ask this because the other day I was contacted by a client from last November who misplaced the USB thumbdrive I sent to them with 146 full-resolution JPEGs from an event I worked for them. He asked if the photos could be shared on Dropbox. Maybe it's my computer connection, but 2+ hours later it was done uploading. I have an 8-hour convention this Saturday, and the client want Dropbox delivery. If you figure like I figure, and approximate 30-50 "picks" per hour, that's a LOT of file space. I haven't asked how they will be used. But it gets me to wonder if I can limit the file sizes, and by how much, even if some could possible be made into prints. Rule-of-thumb or any measure thoughts, suggestions, greatly appreciated. 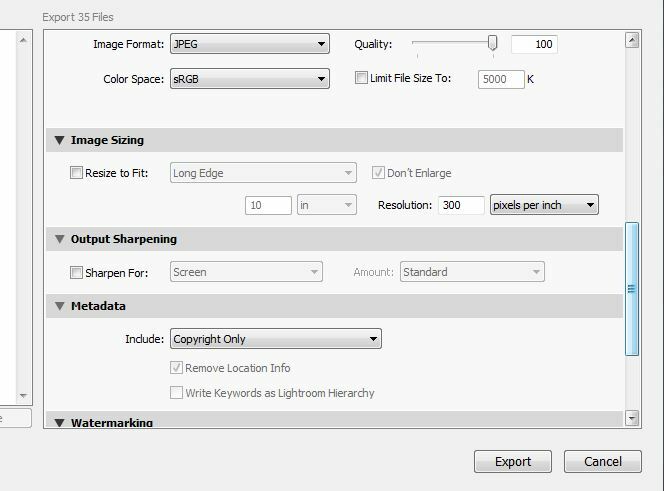 You can change the jpeg quality from 12 back to 10 which dramatically reduces file size with no drop in quality at all, up to around 12x18. I have also printed plenty of images at 16x20 on a 'Quality 10' setting and no visible quality loss whatsoever. You will get those people arguing it is not right, but, I maintain if you cannot see the detriment to the image unless you are squizzing it up close at 100% on a monitor, it will *never* print like that with pixel peeping. Regarding Dropbox, if you are a 'free' user you are limited at upload to around the 100kb/sec mark, if you go to Pro (which I have not) it will dramatically increase in upload speed as I did a 'free trial' a few months back when offered and it increased to up around 400-500 kb/sec. OK, Trev, thanks. I have to look for the quality setting you are talking about when I get home tonight. What I have been doing is setting a file-size limit. Sorry, I am so used to Photoshop with it's Quality Box that I forgot it's not an option in LR. It's percentage based, so pick say 80%, but, the best way is to limit the measurement on the Long Side to a manageable width/depth like 3800 Pixels or an Inch based measurement, you will need to test some files then save a preset. My clients get a usb stick containing 'web ready' copies of their photos that they have picked for prints or an album. They can then use them for Facebook, web, email etc and have a small file size, usually 1000pixels long edge, 72ppi and 75% quality from LR. 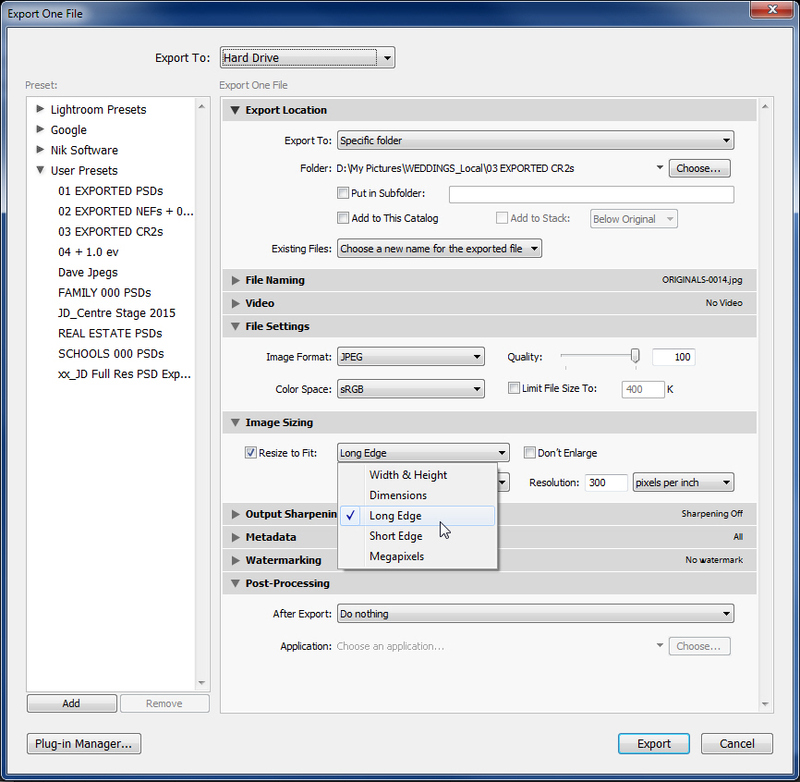 It only takes a few seconds to re-export the pics from LR with these settings. lain - I had a similar thought for the conference coming up, only in reverse: the web-ready photos go onto Dropbox, and the full-resolution photos go on a USB stick. That way my Dropbox doesn't get to it's limit, they have photos suitable for web, etc., and then have the full res for printing. Agree, I do up a folder, same as Iain, called 'Facebook Resolution' as well as the 'Masters' folder of full res and they go onto USB sticks. That way it stops Facebook 'crunching' up full res files which then become pixelated/horrible, and are perfect for viewing. I have an action which incrementally decreases sizes 10% at a time and very slightly sharpens each time so you get crisp 72 DPI resolution anywhere from 800 Pixels to 1500 Pixels on the Long Side, normally I choose 900 Pixels. I would agree about changing the JPG quality from level12, to 10. As already mentioned, you could even bring the quality down to 8 for web or other use, so that your Dropbox folder doesn't get jammed, and then send them the level 10 images via a USB stick. Thanks. I don't remember these settings from LR (if that's what you refer to). In the past, I had been clicking the box to limit the file size. Is it better, from a resolution standpoint, to define the pixel count on the long edge, like it has been suggested, as opposed to limiting the file size? Hi - I hate to repeat a question, but can anyone tell me the difference between setting the pixel count and limiting the file size to X number of megabytes? Pixel count gives a definitive measurement to an image, eg: if you put a specified pixel count on a long side of the image say of 4000px, (or inches) it will *always* be that no matter what Mb/Kb the file size might end up, as that is governed by the actual content of an image, lots of details, the larger the file size in Mb. It's a 'known' measurement so therefore all the images displayed will look the same and be consistent in appearance when viewed, but the actual file size will vary. 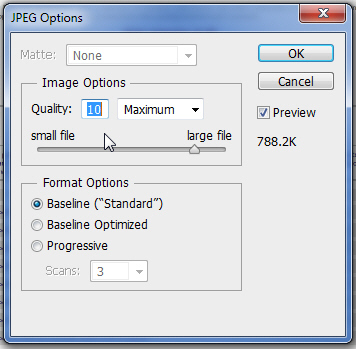 Every file of an image cannot be precisely the same size, because of the content of that file. If you have file of just a plain wall it will be quite low although the actual measurement will be the same of a file that contains lots of tree/grass which can be quite large in file size. Stick to a designated measurement of length as opposed to a certain size so the images are consistent. An analogy would be say you have 100 feet to travel from point A to point B, that will always be a constant, (pixel length) but depending on how you get from point A to point B by walking, running, driving it will take different times (file size) but 100 feet will always be a 100 feet, hope I made sense. As I said, stick to a file size in measurement, when I want to post stuff on the web, say in this forum, I resize my pics to 900 pixels on the long side (meaning which ever is the long size of Portrait or Landscape it will always be 900 pixels and the short side will fall proportionately into place) regardless if one image is 345 Kb, another 303 Kb, etc. etc. The issue with LR, or at least it's an issue for me, is the dialog box isn't anything like PS. What I wish is that if you choose to specify the "long edge", shouldn't the "dpi" box be greyed out? It's just very different and hard to relate. Nope, you just merely put in the DPI you want, highlight the 300 and change to 72 *if* web size images are want you want of course. Just swipe/highlight/type and put in your desired DPI, make sure you select Pixels Per Inch and not per Cm, otherwise you will end up with monster files, 2 1/2 times larger since there is 2.5 cm per inch. DPI as I said, is merely the 'resolution' you need to either print or just for web viewing, resolution is totally independent on the actual 'size' of an image, and size of an image is broken into 2 parts if you like, it's the actual dimensions in pixel or inches or cm form, plus the actual 'file size' is then the last thing that is calculated because 'file size' depends on your DPI *and* your file dimensions. You need to get your head around the fact you are dealing with 3 things, and although they are ultimately related, they are also independent things. DPI = resolution (nothing to do with size), you could have a 6x4 image still at 300 DPI for printing or a 30x40 inch @ 300 DPI or both sizes but with 72 DPI. File Size = the actual amount of information in a file as in Megabytes or Kilobytes and that is only determined once the other 2 factors are decided upon, even then, an equal DPI + Size does not equate to equal File Sizes of all images, it is also governed by content of an image, with lots of details or just a plain item as I stated above, wall or lots of grass/trees where there is more detail/information within any given file. I cannot put it any other way that I have, so hope you understand. As an aside, DPI is the old 'printing' term used in newspapers/magazines etc. as in Dots Per Inch as newspapers/magazines images were made up with series of hundreds of 'dots' of ink per inch. PPI is Pixels Per Inch with the coming of Digital, but they are both one and the same thing, just 'old school' and new whereby 'pixels' are the square 'dots' which make up an image with varying shades of colours and density but the vast majority of photographers are from an era of Dots Per Inch which to this day I still say. We no longer live in a world where computer displays are 72dpi and print is 300dpi. DPI values of devices are all over the map. But, they are easy to understand since they always denote an absolute value; how many dots make up one inch. I would recommend thinking in terms of real world physical size. e.g. on an original iPhone (screen of 163 dpi), the recommended smallest size of a button is 44 x 44 points; about one-quarter inch by one-quarter inch. On those original phones, each point was backed by a single pixel and so to create a quarter-inch square button, you would create a 44 x 44 pixel image (the graphics engine did not care what dpi was stored in the image; just the pixel data. It was up to you the author to understand that the target device of the image was 163 dpi). When the retina phones came out (326 dpi), you authored two sets of images. One for older devices and one for retina devices. So if you had a button of 44 x 44 pixels for the old devices, you also created an 88 x 88 for the retina devices. That ensured the button would have the same physical size on all devices. For photos, it's always best to save out the highest possible pixel dimensions. This allows for the best possible output to displays as well as to printers. You can always do things in an exact manner too as with the iPhone image example above. For example, you want to create 8 x 10 prints and your printer can output at 300 dpi. There, you can scale down your image to be 2400 x 3000 pixels. Every one of its pixels will then be represented in your print. Finally, note that some software can take cues from the dpi setting (but most do not). e.g. with the 8 x 10 example above, how would a particular piece of software draw that so that it actually took up 8 x 10 physical inches of your display just as the physical prints did? The answer is that the software would need to understand the dpi of your display device and if that was a different value than the 300 dpi of the printer, it would need to scale accordingly. In summary, it's all about the desired physical size of your image. That size, coupled with the dpi of the target device will then allow you to compute the minimum required pixel dimensions.